Gerard Jackson, head, government and stakeholder relations, BPTT, presents the award for president of the year to Naparima Girls’ Shivala Rampersad, at the Future Unlimited Banquet and Awards Ceremony at Cascadia Hotel and Conference Centre. 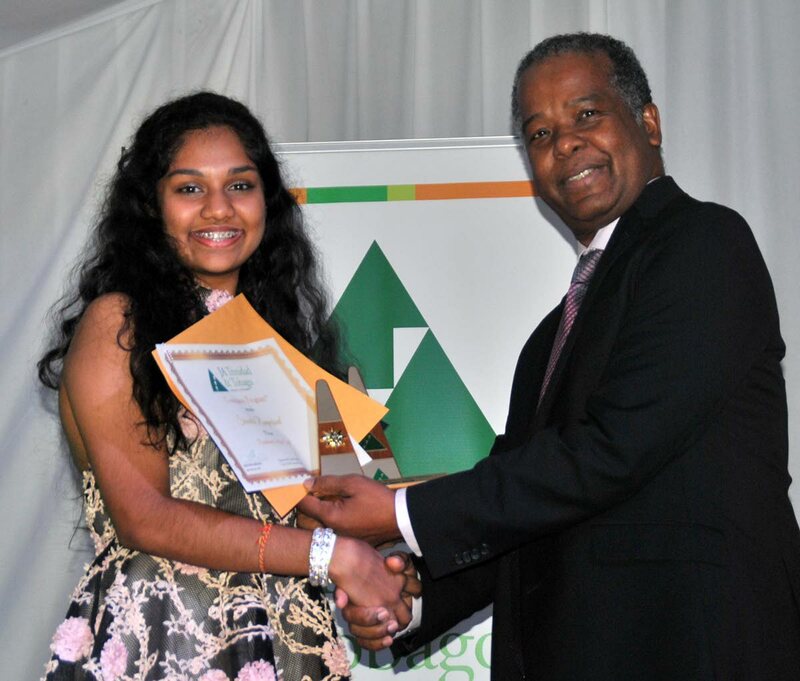 SHIVALA RAMPERSAD, a form four student of Naparima Girls’ High School, walked away with double honours at the 48th Annual Future Unlimited Banquet and Awards Ceremony of Junior Achievement TT. She took the award of president of the year and leading her company, Colibri, to the company of the year accolade. After the presentation of the overall trophy, Rampersad was joined on stage by her ecstatic company colleagues, who celebrated their victory for several minutes on July 7. Earlier, Rampersad was presented with the president award by Gerard Jackson, head, government and stakeholder relations, BPTT, long-standing sponsor of the JA movement, said a media release. 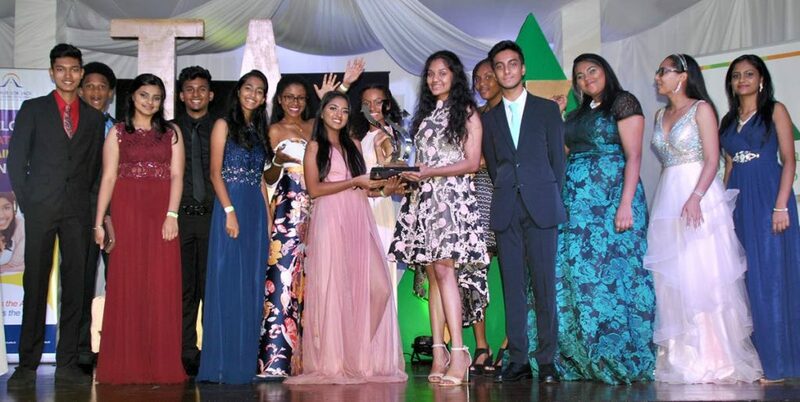 Students of Junior Achievement company,Colibri, join their president, Shivala Rampersad, sixth from right, as they celebrate their victory as company of the year. 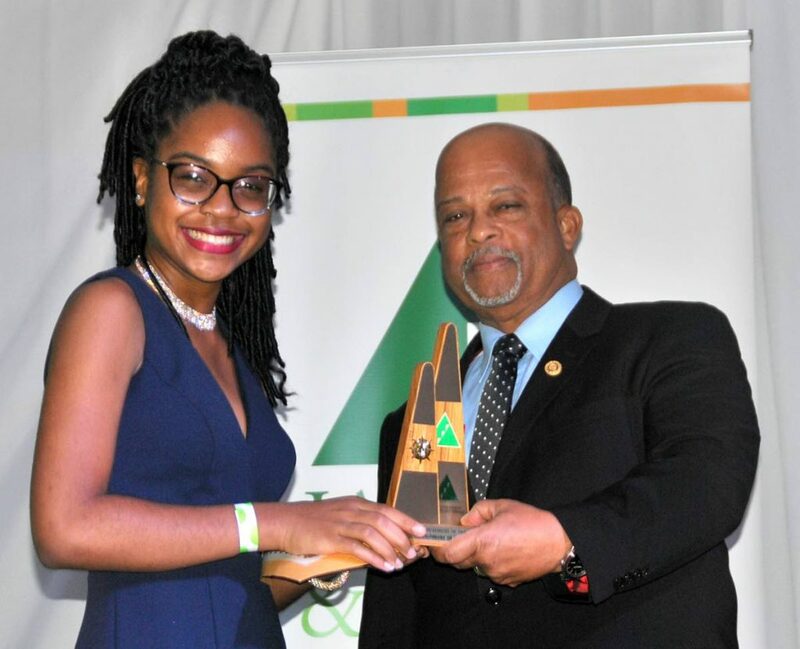 The signature JA event, held at the Cascadia Hotel and Conference Centre, St Ann’s, saw Ashley Wharwood, a member of Finessecompany and a student of St Joseph’s Convent (San Fernando), cop the prestigious Achiever of the Year award. Both Rampersad and Wharwood expressed delight on being selected. “This is a great achievement but I owe a lot to the other stakeholders of Colibri who all pulled their weight,” Rampersad said. “I also have to thank my colleagues since we all worked as a team. The whole experience has been wonderful and I was able to make new friends along the journey,” said Wharwood. Some 700 students, representing 33 companies, participated in the project. Open to form four students, participants learned the fundamentals of entrepreneurship by owning and operating a business under the guidance of Junior Achievement. Ashley Wharwood of St Joseph’s Convent, San Fernando, receives the award as Achiever of the year from Michael Callender, deputy chairman, JA Trinidad and Tobago at the organisation’s Future Unlimited Banquet and Awards ceremony. Feature speaker David Dulal-Whiteway, CEO of the Arthur Lok Jack Global School of Business, thanked Junior Achievement TT for its determination in encouraging young people to be active, innovative, creative and socially responsible citizens. By the year 2030, he told the students, technology and internet advances and the growth of robotics and artificial intelligence would bring a new range of occupations where they would need to be bilingual and multi-skilled. JA executive director J Errol Lewis said total estimated income for the 33 companies was in excess of $200,000, with the annual trade fair, held in April at Woodford Square, Port of Spain, accounting for $100,000. He said that each company contributed a portion of the money it earned and/or its members’ time toward a charity of their choice and provided more than 130 hampers to families in need. “Use your energies positively as you pursue your careers and your life goals. As our banner declares, your future is unlimited. Think big; think far,” Lewis urged the achievers. Lewis said that, for the first time, officers of the various companies were trained by a learning institution in the principles of establishing and running a successful business through a partnership with the Arthur Lok Jack business school. Other JA partners are Scotiabank and the Division of Cooperatives of the Ministry of Labour and Small and Micro Enterprise Development. Reply to "JA companies earn $200,000"